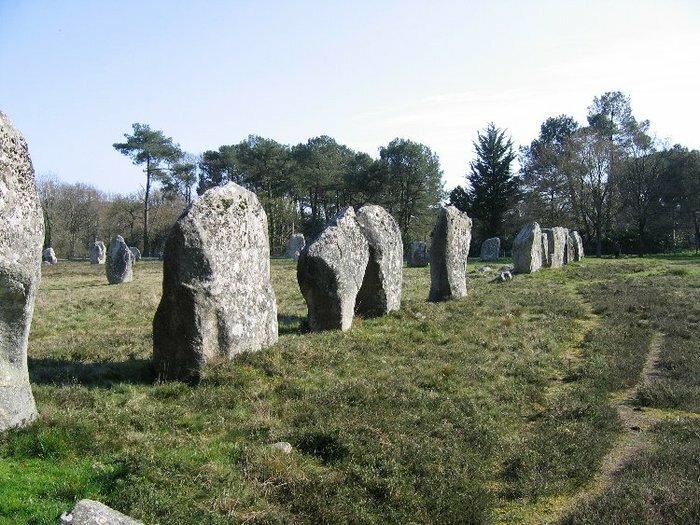 Megaliths of Brittany: Farmers or sea people? In the previous chapter, we have briefly touched this kind of megaliths. Let us consider it now in detail. Moreover, here, unlike in Salisbury plains, there are not so many of them. Below, in figure 4.1 the places of their location on the sites Kerlescan and Kermario are presented. We will decimate heights as we did before. Figure 4.0 − a) Barrow of Kermario alignments. b) The work chart of barrows. Barrows are marked by a red line. A vertical black segment designates menhirs. Figure 4.1 − a) The site of Kerleskan alignments b) The chart of functioning of barrows and alignments. Now we can distinctly see nuances of location of barrows on the relief, and that both are really established across streams, which could flow in the nearest depressions. On the field, these barrows are hardly noticeable even from a close distance. Their height is less than a meter, their length is a couple tens of meters, and their width is a few meters. The first one marked in figure 4.1a is located right among alignments, and many blocks are established behind it, except for one, which is the highest and pierces it. In its foundation in the body of the barrow, there is a small chamber with a side entrance, like a small dolmen. Such mutual relations of megaliths allow restoring the sequence of their construction. First a menhir was established which apparently marked a perspective place for gathering waste during flooding. Then nearby a small house-chamber was made. Then a barrow was made. It became an addition to a small natural ledge of the relief and this way increased productive power of this place. Last stage in the struggle for increase of collection useful product was the creation of alignmens. Pay attention at the top part of this picture (height 28 m) − there too is a menhir. This is le Geant du Manio − the biggest menhir in the area. 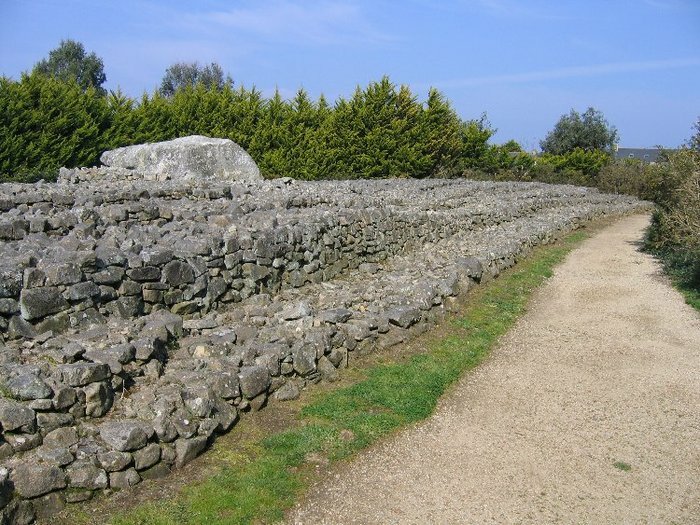 Next to it is a construction called a "quadrilatere" which represents a low solid stone fence (see Figure 4.2). It seems to me, that it was a place of storage of collected driftwood. The wall of stone was made not for beauty purposes, it could protect the heaps of driftwood collected at the top of the island from scattering at unusually high rising of water. 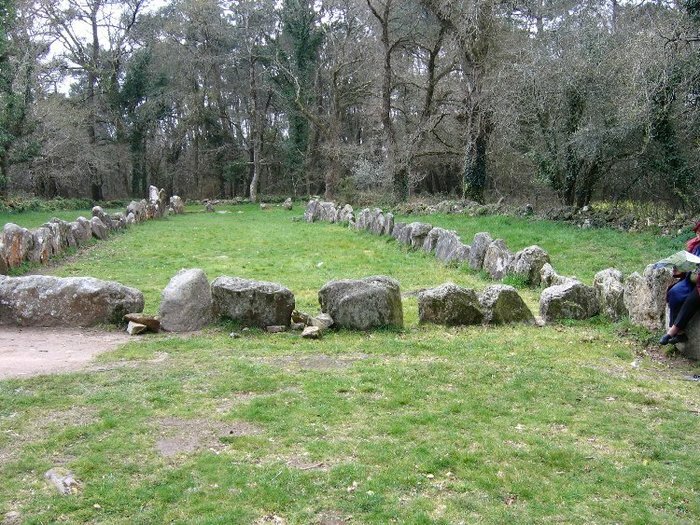 РFigure 4.2 − The Quadrilatere made of stones near le Giant du Manio menhir. The barrow of Kerlescan alignments (Figure 4.1c) is established at the flat top of the hill (25 m heigh), instead of the slope. The place it also is marked by a menhir. The barrow was oriented towards the stream washing the height on the West, and alignments were oriented towards the stream from the East. From the southern part of the barrow, the remains of cromlech are located. There is another cromlech on the North. The blocks forming cromlechs are established with a big interval between each other, and could only slightly fence off the places where probably some slow whirlpools were formed when water was flowing in the depression forward or backward. Since we have mentioned the top of the hill of Kerlescan alignments, we shall note here one more construction − a wall stretching from the foundation of the barrow to the South, almost strictly following the meridian (it is marked by a red arrow). Unlike alignments, its stones are established much more densely (see Figure 4.3). By its position at the watershed in a zone of natural division of currents to the right and to the left, it interfered with carrying out the driftwood accumulated at the foundation of alignments from the East to the West, or from the West to the East. 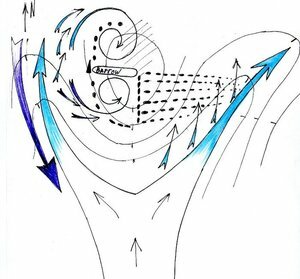 That is, played a role of a barrier, in case of a crosswind. Except for this function, it also created a wind shadow, blocking the rests of driftwood. Figure 4.3 − The wall on the western end of Kerlescan alignments. The fragments of similar walls we can find farther to the West of Carnac. They are also established along the lines of stretching of heights − natural arrows dividing streams. 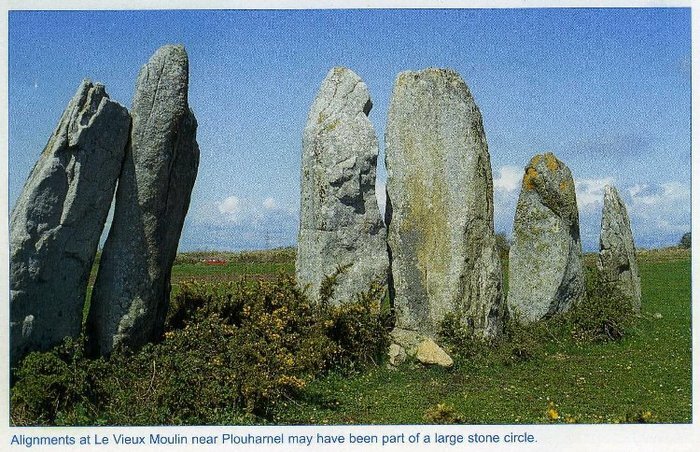 It is so-called group of menhirs Vieux Moulin (Figure 4.5), the end of St-Barbe alignmemts (Figure 4.4) to northwest from a township Plouharnel. 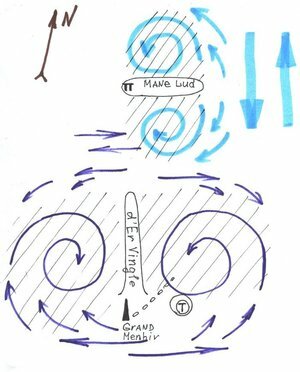 Most likely, they also had the same function − to close the alignments from the end and to interfere an output of the accumulated driftwood when the wind direction changed. 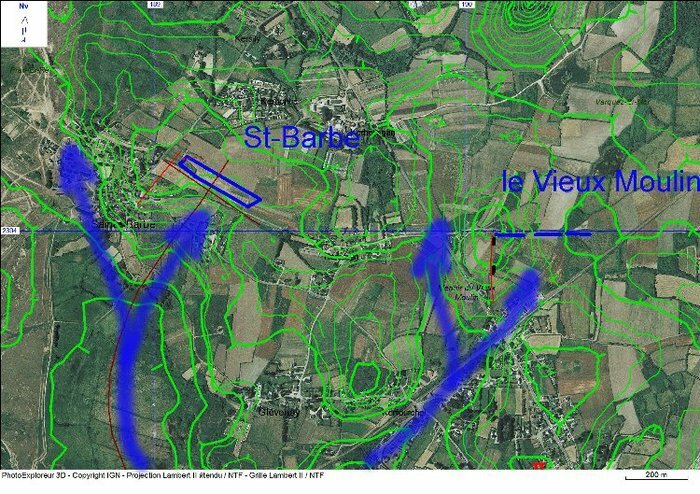 Figure 4.4 − The end of St-Barbe alignments. 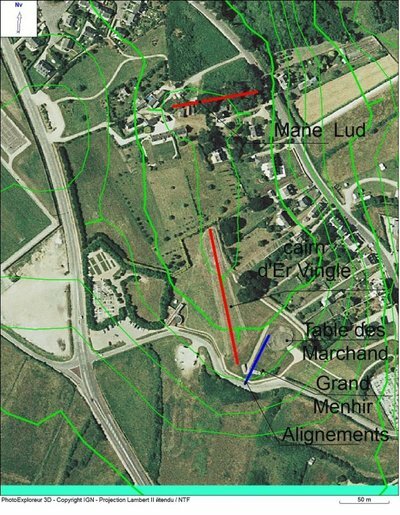 Figure 4.6 − The arrangement of walls of St-Barbe alignments (on the left) and Vieux Moulin (on the right). A red line designates the direction of their spreading. The dotted blue line designates a possible position of the alignments themselves, which were not preserved. This chart shows the functioning of St. Michel barrow located in town Carnac. 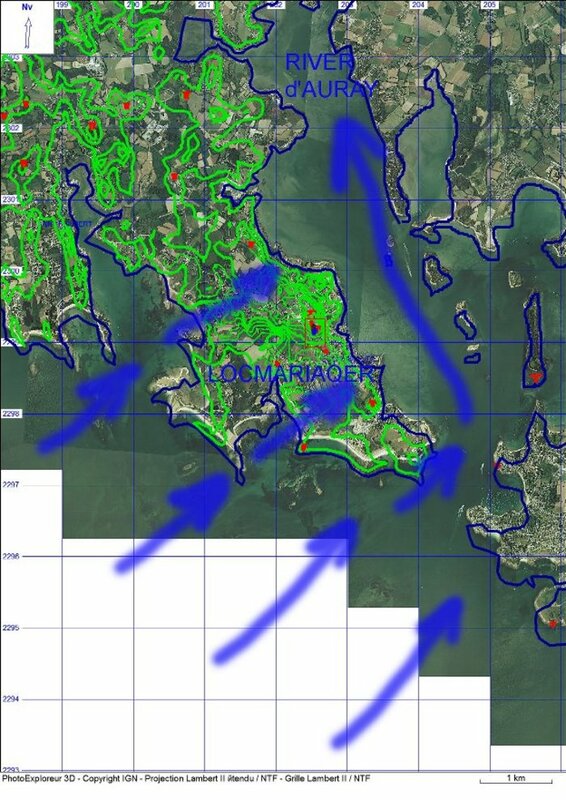 Now we shall move to Locmariaquer peninsula, to a similar village located 10 km to the East of Carnac. Here atop of a low hill the museum complex is created in which one can see a split menhir Grand Menhir Brise, tumulus (cairn) Table du Marchand, barrow (sometimes called cairn) d’Er Vingle. All restored, beautiful, partially created anew. In figure 4.7 a red rectangular marks this site. Figure 4.7 – The Locmariaquer peninsula. The chart of currents. (NB: ignore the displacement of coast and contours. This is expenses of preservation of the image from program PhotoExplorer. To some extent, it exists on all photographic sketches). 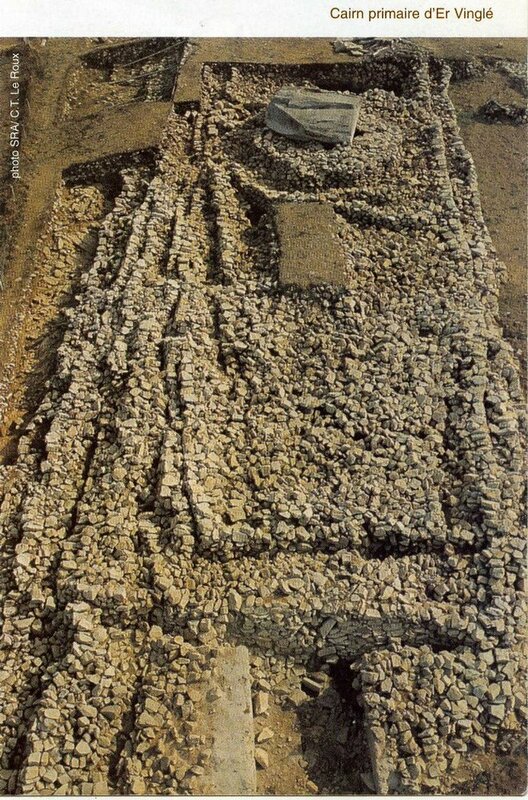 Before the beginning of consideration of the arrangement of megaliths, we shall make the same imaginable transformation of the relief that we had done earlier − we shall decimate it. Then the top of a hill where all of them are located will go down to the height of 1.5-2 m. During the flooding in the past there was a chain of islands and shallows on this place through which during incoming tides or onsets there was a movement of water from SW to NE equalizing the levels in the Quiberon bay and the Morbihan gulf. However, having got into the gulf water spread in all its corners, one of which was river d’Auray depression. Even now during incoming tides, the seawaters flow into it as far as 20-30 km, and earlier with a flat relief, it could be much more. Thus, along the eastern coast of this peninsula NNW current was created, similar to those, which appeared in our depressions numbered 1, 2, 3. If one follows the logic of our assumptions, the constructions for catching floating waste had to be located in two directions. They had to be set across the stream compensating the water level in the gulf Morbihan, and across the stream into the depression of river d’Auray. Now we shall look at figure 4.8a. Here is a close view of megaliths inside of a red rectangular with their names specified. 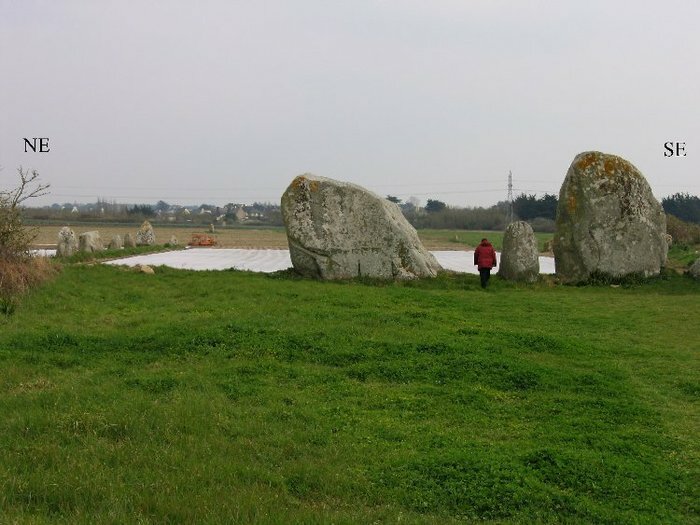 Figure 4.8 − a) The site with a big broken menhir (Grand Menhir Brise) in Locmariaquer. b) Basic diagram of barrows’ functioning on site Locmariaquer. Hatching marks zones of stagnation. As usual, all of them are attached to the top of a height, which is now 16 m high. The direction of the restored barrow d’Er Vingle in the best possible way fits the purpose of catching of waste when water moves out of and into the Morbihan gulf. The borders of this large construction of nearly 170 m long are well visible in the picture. Beginning in the south, at a big menhir where in the past apparently was the highest place the barrow hardly sticks above the surface. A half of its length it is made of soil and only framed by stones, towering no more than 1 m. Further to the north it is made only of stones, the dam is narrowed, and the height reaches 1.5-1.7 m. Apparently, a downturn of the slope used to go in this direction. In figure 4.10 one can see the internal structure of d’Er Vingle barrow. This is a consequence of its building-up. 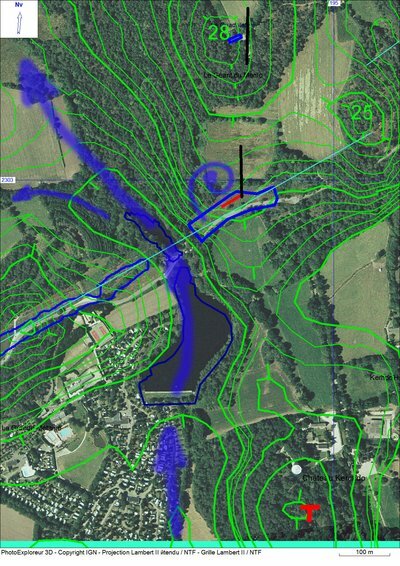 Probably, it was caused by desire to increase the sizes of driftwood accumulation zones, and, probably, the first changes in the relief, which led to dereliction during the floods reducing an overall performance of the barrow. 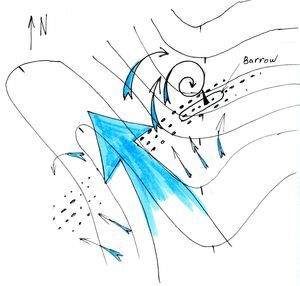 Figure 4.9 − This is how the barrow d’Er Vingle looks now. A view from the south to the northern end. Figure 4.10 − Internal structure of the barrow d’Er Vingle being revealed during the excavations. A photo from the brochure by Jean L’Helgouac’h “Locmariaquer”. A view from the North to the South. And what about the other direction of the current? Did it remain open? No. It seems that there was another barrow for it that has not got into the museum. At the entrance to Locmariaquer from the North one can notice a long mold covered by forest to the right of the road. This is barrow Mane Lud. Its length from the West to the East is 80 m, its width at the foundation is 50 m, and its height increases from the West to the East up to 5 m. It is extended perpendicularly to the coast, and, probably, in the ancient times at water inflow into d’Auray depression it detained floating driftwood. 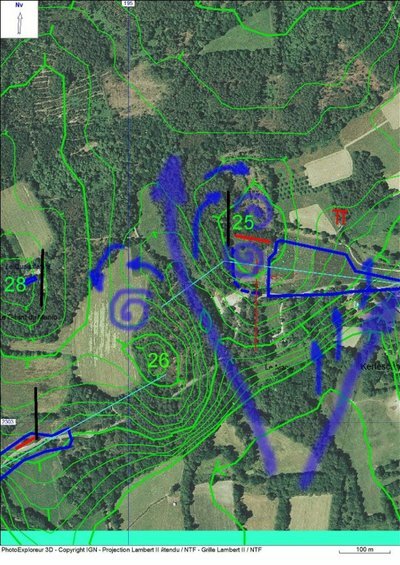 The chart of functioning of the barrows on this site is shown in figure 4.8b. 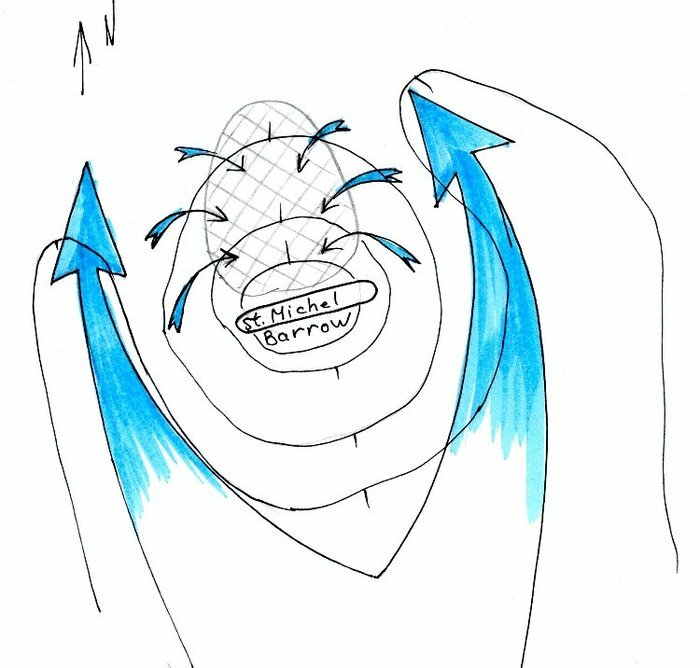 Pay attention at the blue line in figure 4.8 occupying an intermediate position in orientation between the first and the second barrows. Along it at the excavations, a series of holes filled by small stones was found. Most likely, this is all that remained from one line of alignments once standing here. It was located angularly at 45 degrees to the first and the second current. Probably, it was an unsuccessful attempt of construction of the universal construction, designed for both currents. In figure 4.12 it is possible to see how such holes looked in reality, and once again to be convinced of how seriously people took the installation of vertical stones. Figure 4.12 − The holes from blocks on the site Locmariaquer found under a layer of a ground during the excavations. 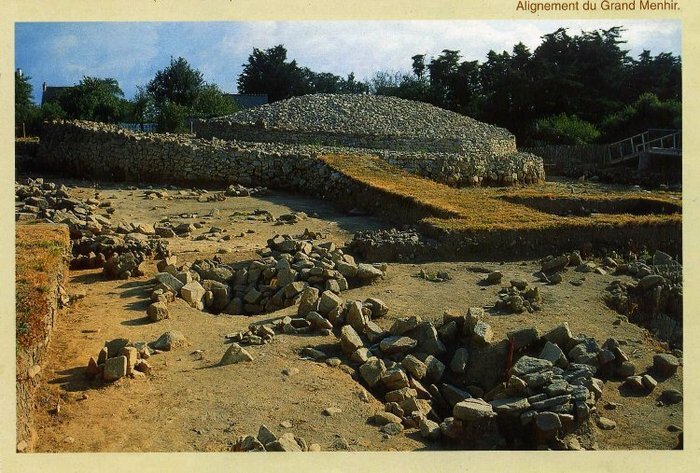 A photo from a brochure by Jean L’Helgouac’h “Locmariaquer”. In the conclusion of this chapter, I would like to note, that the position of barrows in Brittany and in England is very similar. They are located either along watersheds or across them. This testifies that to the north from Brittany, on the British Isles, people also used to catch floating waste and the processes of contrastization of relief were taking a place there as well. Therefore, in spite of preservation of a general plan of the arrangement of heights and depressions, the difference in heights between them increased, and barrows appeared to be lifted onto flood-free levels. Lastly, pay attention to a big horizontal plate in the top part of the picture presented in figure 4.10. It closes from above a small chamber in which traces of burial place were found. Certainly, these burials have ritual value. Most likely, they were called to protect the constructions created with such pains from otherworldly forces by help of the relatives who had stepped off. The custom to bury elders under dwelling reached later times. This situation is usual. Almost in all barrows both in Brittany and in England, they find remains buried in this way. Now, having understood how the barrows functioned it becomes clear that they had not been constructed exactly for burial purposes. An interesting observation − these chambers located in the body of barrows should have been flooded each time at rising of water. In addition, this should have led to changing of a position of human remains and floating (wooden) subjects left in them. That is why, probably, even at the excavation of previously untouched burial places archeologists sometimes found the absence of due order that resulted in bewilderment and made them think that the remains had been transferred from somewhere else. ﻿© 2014 - At full or partial use of materials the reference to www.NewGeology.ru is required.